At the end of Disney’s The Jungle Book, Mowgli sees a girl from the village collecting water, and he is utterly enchanted! The panther Bagheera and the Baloo the bear are trying to deliver him safely into the village; but whilst Bagheera knows he must go, Baloo wants him to stay with him in the forest. But, alas, Mowgli is lost to this new world of wonder! “Nobody except those who were there will ever have the wonder-laden memory that a man can retain of the plain of Ypres in April 1915, when the air of Flanders stank of chlorine and the shells were tearing down the poplars along by l’Yperle Canal – or, again, of the charred hillsides of Souville, in July 1916, when they held the odour of death. . . . . Those more than human hours impregnate life with a clinging, ineradicable flavour of exaltation and initiation, as though they had been transferred into the absolute.” The “clinging ineradicable flavour” was perhaps mud – the mud of Ypres in which two hundred thousand British and Commonwealth men died, ninety thousand of them lost in the actual mud. When he entered the war, he was already a priest. One dawn in 1918, camped in a forest in the Oise with his Zouave regiment, he had neither bread nor wine to offer at Mass. He had an idea, however, and he wrote it down. Five years later, he sat on a camp stool inside a tent by the Ordos desert cliffs west of Peking. He reworked his old wartime idea on paper. What God’s priests, if empty-handed, might consecrate at sunrise each day is that one day’s development: all that the evolving world will gain and produce, and all it will lose in exhaustion and suffering. These the priest could raise and offer. “Jesus says, ‘If you eat this bread you will live forever’ (John 6:51). It is so interesting that he chooses taste, flavour, and nutrition as the symbol of how life is transferred and not intellectual cognition. If you live by the momentary identity that others give you, that’s what dies when you die, and you’re left with nothing. Your relative identity passes away, but it is like the painful erasing of an unwanted tattoo. When Jesus says he’s giving himself to you as the bread of life, he’s saying, as it were, ‘Find yourself in me, and this will not pass or change or die. Eat this food as your primary nutrition, and you are indestructable.’ This is your absolute and indestructable identity. … a re-enactment of a salvation event. … the celebration of the sealing of a covenant. … an anticipation of the messianic banquet. 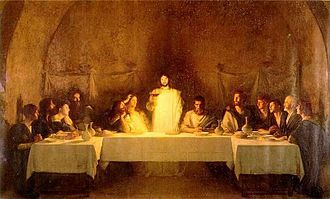 … a remembering of the table fellowship of Jesus with its overtones of God’s acceptance and forgiveness. The Eucharist stands as a bulwark against reducing our participation in salvation to the exercise of devotional practices before God or being recruited to run errands for God. It is hard to get through our heads, but the fact is that we are not in charge of salvation and we can add nothing to it. The Cross is the End of Sacrifice – rejoice and be glad! “We are made, through Christ’s body and blood, God’s sanctuary, God’s holy temple, for the world. Just as bread and wine is transformed by the Holy Spirit to be for us the body and blood of Christ, our lives, our everyday sacrifices, are taken up into his oblation. Through that transformation the sacrifices, so often forced upon us, can become life giving because they have an end. Our sacrifices can be joined to Christ’s sacrifice not because the Lord’s sacrifice is insufficient, but because the sacrifice of the cross is complete, lacking nothing, sufficient for our salvation and the salvation of the world. The Eucharist (or Communion, or Breaking of Bread) is the self-offering of Christ. Time and time again we are given the good gift to participate in this, the Father’s sacrifice of the Son, that all might know that here sacrifice has come to an end, because the cross is the end of sacrifice.